IMPORTANT NOTES: Updating PC Card Catalog to from early versions (v3.0x - 3.20) will also require updating PUBLIC ACCESS and Utilities. v3.5x will NOT run on Windows 95, 98, Me or NT. PC Card Catalog will run on Windows XP, but we can no longer provide installs and updates for XP. Consider switching to a computer with Windows 7 or 10. * Inventory procedure can ignore selected media types to permit "sectional" Inventories. This feature addresses downloadable materials such as eBooks. • CUSTOM REPORTS feature: create and format your own reports. Select only the fields you need. Print or display the results in any order. Lots of "hidden" capabilities. 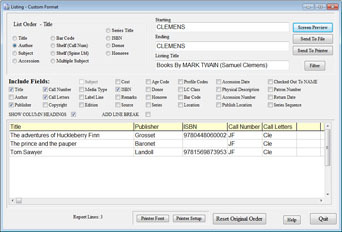 • Create "snapshop" Shelf lists for a focussed Inventory or precise shelf ordering. Reconciles checked-out and on-order items. • UPDATE on CD is mailed to your library. The UPDATE comes with a separate Install program (for Windows 10 and earlier) simplifying the eventual move to another computer. 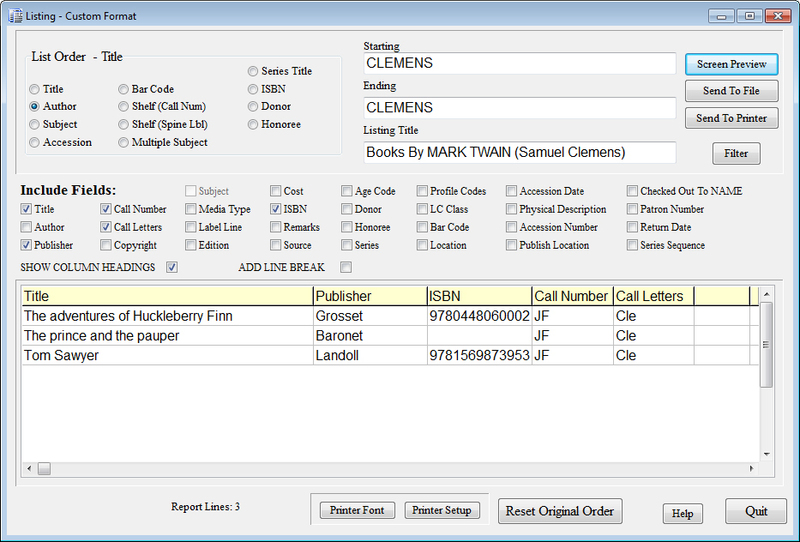 • Includes the wildly popular One-click cataloging (since v3.4x): Type or scan the ISBN onto the NEW Entry screen. Click the qLOC button, and in seconds, the record is completely filled in! You won't believe your eyes! Works with both Dewey and LC cataloging. Uses Library of Congress online catalog. • Includes 90 days of Support at no extra cost: unlimited phone support; no-cost updates; priority e-mail. • Item data now includes a "URL" field to provide access to eBook check out or online documents. • Adding a New Patron is quicker with the "Recall Family Info" feature. Enter common family details only once. • Software automatically checks for updates to assure that you have the very latest version at no cost other than your Support Subscription. • File locations for Backups, exports, MARC imports etc., are "remembered" for more convenient access. • The v3.4 UPDATE for PUBLIC ACCESS is now available. The PUBLIC ACCESS v3.4 is compatible with v3.54. • The v3.4 Homework UPDATE is now available. While HomeWork v3.30 is compatible with v3.54, we think you will want to UPDATE your HomeWork, too. It now includes qLOC One-click cataloging. • If you are UPDATING PC Card Catalog from versions prior to v3.30, you must UPDATE your HomeWork to the current version (v3.4). • No v3.5 UPDATE is currently available for LOC Pick. This feature (qLOC) is built into the PC Card Catalog program. • Required for v3.5 deletion recovery. • Works with all versions of PC Card Catalog deleted data. • Works with all versions of PC Card Catalog backup files. * QLOC: revised procedure to reduce socket errors and occassional freeze. * QLOC: Improved handling of certain non-English characters. * QLOC Imports MARC <520> tag. * QLOC: revised the server connection to match changes implemented by LOC. * Corrected Custom Reports "Save to File" selection list. 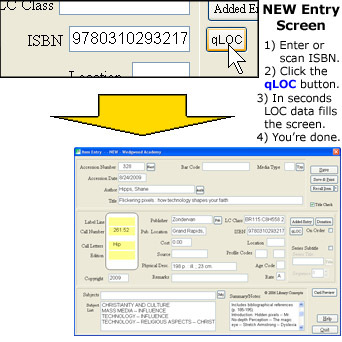 * Expanded ISBN entry field to accept dashs (-) for ISBN-13. Only non-dash characters are saved, however. * Implemented Windows 10 revisions. * Revised several MARC tag updates for improved qLOC and Import accuracy. * Added Inventory settings to better handle eBooks and other downloadable materilas. "Section" Inventories can now be implemented. * Added URL field. URL link provides access to eBook checkout and online documents. * Custom Reports feature added. Permits user to design unique listings for print, display or export. * Export Custom Reports as TEXT, CSV (Excel), TAB-delimited or XML file formats. * "Snapshot" Shelf lists reconcile checkouts and on-order items to provide an accurate AS-IS shelf listing. * Recall existing "family" information when adding a new patron so as to reduce the entry time. * Check-out status added to Alter Item and Delete screens. * UPDATE CD includes the v3.52 Install for Win7/vista and for XP/2000 to simplify the "moving to a new computer" process. * The Reservation selection screen is larger and includes additional information to assure selection of the correct item. * Bar code label printing now permits the selection of either 9- or 12-digit labels. The shorter option wirks better with lower resolution printers and shorter label stock. * Item Usage report uses and improved column formatting and includes Accession Date. * Listings onscreen are more stable and no longer require "refresh" when switching between screens. * Revised "Series" and "Series Title" labels to reflect the terms commonly used. * The "Print Status" receipt listing now includes transaction date and adds Media Types to the listed titles. * "Remembers" last used file location for common file transfers such as Backups, MARC imports, saving Reports. * Resolved errors generated in rare circumstances while sending e-mail notices. * Established consistent configuration file locations to simplfy software changes and Support. * Resolved the Backup/ Import/ Export counter appearing to "freeze" while actually continuing the process. * Listings onscreen permit 'double-clicking' a title to open the "Alter Item" screen for editing. * Item Usage reports can be limited to ranges of Usage, ie. < or > a defined number of check outs. * Items Out. Overdue, and Fines can be printed in Patron order, in Shelf order or in Date Due Order. * Mouse scroll-wheel scrolls both the Catalog List and Item Detail screens.